She’s sweet and cuddly and oh so soft! Meet Bridget’s newest companion, “Candy” (as Bridget calls her)! She’s a Christmas Cookie Bear from Build-A-Bear Workshop and is part of their Winter Collection. 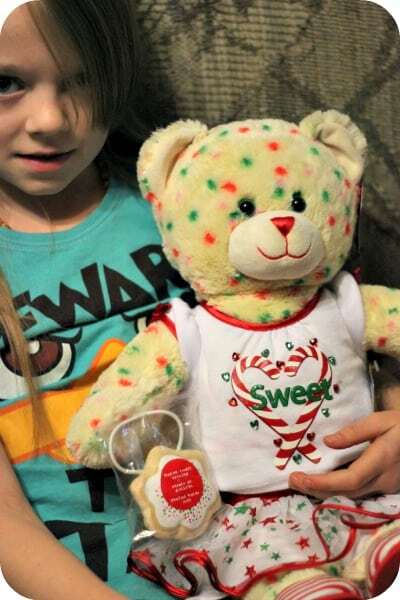 The Christmas Cookie Bear measures 17 inches tall and her fur is an off-white with red and green sprinkles. 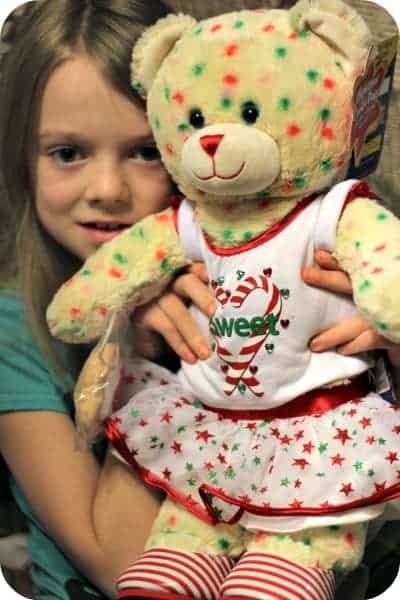 Bridget’s bear was dressed in a white shirt that said “Sweet” with a candy cane heart around it and a white tulle skirt with red and green stars. Her shoes are red and white stripes. She also came with a sugar cookie that smells just like the real thing! Bridget was so excited to open the box and discover her new friend inside. She immediately noticed the sweet scent and kept sniffing the bear. I couldn’t help but sniff her too. She smells like a vanilla candle, but it wasn’t overpowering at all. It’s a nice light, sweet fragrance. This was Bridget’s first experience with a bear from Build-A-Bear Workshop. I notice they have locations across Canada and the closest one to us is at the mall in Dartmouth, NS. I’ll be taking her there on our next shopping trip to the city and see if we can buy some more outfits for “Candy” or maybe a friend or two. Kids can play online at Bearville where there’s games and videos to watch. There’s also free Build-A-Bear Workshop app for iPhone, iPod and iPad. Check out the Build-A-Bear Workshop website for a location near you. Their Christmas Cookie Bear is a festive & lovable gift for a little one on your shopping list! My sister loved Build A Bear when she was younger. I remember she had a bunch of her birthday parties there. It’s really nice. Love Build a Bear. Such a great idea! Very cute bear, we have a few Build a Bears ourselves and always have fun there. I am sure my daughter would love this one! That’s such a cute bear! I love how many different options they give you when creating a bear. I’ve never had the pleasure of experiencing Build A Bear Workshops, but I think my niece may enjoy it. Thank you for the review. I HAVE THIS BEAR!!! I named her Vanilla Noelle and I just love her. her sugar cookie plush reminds me of Vanilla exactly. but she’s not the only one I have, I also have the Merry Mint Pup, Pink Flurry Teddy, Colorful Stars Bear, Hugs-A-Plenty Puppy and the Lucky Clover Teddy.